Deniz Akbulut, the lawyer for noncommissioned officer Gökhan Güçlü, one of the suspects on trial for an assassination attempt against President Recep Tayyip Erdoğan on the night of a failed coup last year, was detained as he was leaving the Muğla Courthouse after a hearing on Wednesday and arrested by a court as part of an investigation into halted intelligence agency trucks in 2014. According to the HaberTürk daily, Akbulut was accused of being a “courier” between gendarmes who stopped Syria-bound National Intelligence Organization (MİT) trucks near Adana in 2014 and Hamza Ali Ece, an alleged imam of the Gülen movement, which is accused of being behind the failed coup. The movement strongly denies the accusations. Akbulut was arrested by a court on Wednesday. 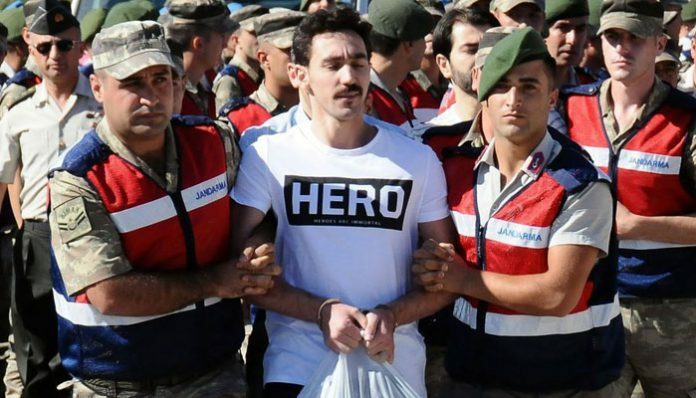 Several people across Turkey have been detained, some of them arrested, for wearing hero T-shirts. In January 2014 a number of trucks that were found to belong to MİT were stopped by gendarmes in two separate incidents in the southern provinces of Hatay and Adana, after prosecutors received tipoffs that they were carrying arms to Syria. Although the Justice and Development Party (AKP) government claimed that the trucks were transporting humanitarian aid to the Turkmen community in Syria, opposition voices questioned why, if the operation was within the law, the government intervened to prevent the trucks from being searched. A case was filed against those involved in the investigation and an indictment, which was accepted by the Tarsus High Criminal Court in July 2015, seeks life sentences for Adana Chief Public Prosecutor Süleyman Bağrıyanık, former Adana Deputy Chief Public Prosecutor Ahmet Karaca and Adana prosecutors Aziz Takçı and Özcan Şişman, as well as Gendarmerie Commander Col. Özkan Çokay, who were all involved in the investigation.